Australia’s next-generation Antarctic Supply and Research Vessel (ASRV) will use a custom-designed ballast water management system (BWMS) to support its missions in arduous conditions. Dutch shipbuilding company Damen has announced the Trojan Marinex BWT 250 will be used as the BWMS, following Damen Green Solutions' extensive assessment of all options. Given the requirements of its role and the highly sensitive nature of the environment in which it will be operating, Damen said the ASRV needs a ballast water management system with specific operational capabilities. These include the ability to operate effectively in very cold waters, to use no chemicals, to generate no by-products and to be as compact as possible. Damen says the Canadian-made Trojan Marinex ballast water treatment system suite provides exceptionally compact solutions that deliver both filtration and UV treatment within a single unit. The design of the BWMS has no chemical inputs, creates no by-products and is not subject to corrosion. The manufacturer added they are also easy to maintain, and the BWT 250 requires only 14 kW of power. A significant additional benefit of the Trojan Marinex system is its ability to operate at 100 per cent effectiveness in water temperatures down to -2 degrees. The BWMS also has exceptionally low UV transmittance, which is vital in the Southern Ocean. "At Damen Green Solutions, we partnered with Trojan Marinex to design a ‘plug-and-play’ installation for DSNS [Damen Schelde Naval Shipbuilding]," said Stefhan van Esch, design and proposal engineer at Damen. "Together we created a bespoke design that mounts the entire BWMS on a three-metre by one-metre skid that can be easily and quickly fitted into the available footprint in the engine room. Prior to leaving the manufacturing works it will undergo a factory acceptance test, leaving DSNS with the simple matter of connecting up the power and the main pipes once it is aboard the ASRV. The Trojan Marinex BWT 250 will then be ready to disinfect and treat up to 250 cubic metres of seawater an hour." 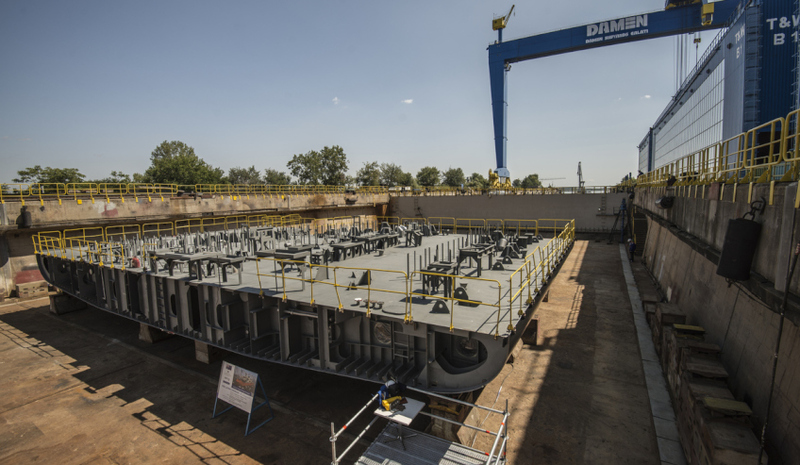 Construction of the 160-metre ASRV began in May at Damen Shipyards Galati. The BWMS will be installed later in 2017. The vessel is expected to be operational in 2020.